1. 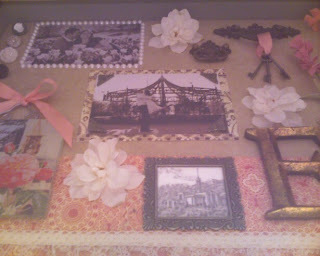 I finished my memory box. I uploaded a super blurry and non-inclusive picture to keep you in suspense, not because it was taken on my crappy camera phone... Guess you'll have to come to the reception to see the real deal :) And thank you again to Maddie and Rebecca for supplying the artistic talent. 2. I, Brooke Almost-Emery, single-handedly convinced the males at my dad's house to watch a Jane Austen movie. That's right. Taylor, the two Johns, McKay, and (miracle of miracles) Sam were all down there. Yes, they made fun of the it the whole time, but still. They watched it. I am all sorts of proud of myself. You're off to a great start. You know what the scripture says, "Train up a husband in the way he should go, and when he is old he will not depart from it."